Six groups of fossil remains of Kimberella quadrata are described. They represent the imprints of the body in different types of preservation (including the group of specimens that are elongated more than twice in comparison with the common ones) and also the feeding traces and mucus secretions. The imprint is considered to be created only by the upper side of the body. The fossil material shows that Kimberella had hard sclerites, probably of aragonite, and several teeth in its mouth. Kimberella is suggested to have “the mantle” with sclerites, wider foot, which was spread over the outer surface of the mantle, and the strong transverse and longitudinal musculature. Original Russian Text © A.Yu. 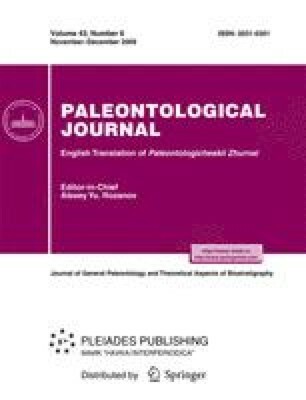 Ivantsov, 2009, published in Paleontologicheskii Zhurnal, 2009, No. 6, pp. 3–12.